Article about GCO (page 12)! 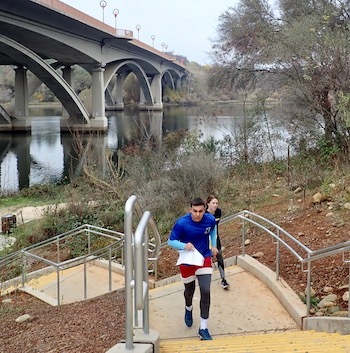 River views and steps marked the Old Town Folsom Scramble. What is Orienteering? It is a world-wide sport. It consists of finding your way to specific points on a course in a park or similar place, walking or running and using a special detailed map and a compass. It's the perfect sport—exercising both the mind and the body. It's great for all ages! We schedule meets at local parks and always feature instruction for beginners. To find out more about orienteering and our club, browse around this site, starting with About Us. Check out this cool new video from the International Orienteering Federation. Fast foot-O as well as even faster ski-O!